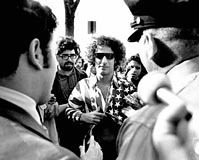 Back in the Stoned Ages of the '60's Mr. Abbie Hoffman, wearing a shirt with stars and stripes on the U.S. Capitol grounds in 1968, was arrested and charged with mutilating the American flag. Things were tense back then. There was an (unpopular) war going on. Kids were getting killed in Viet Nam for principles even some of their leaders did not believe in. It's good to know that, close to 40 years later, things have changed so much for the better! 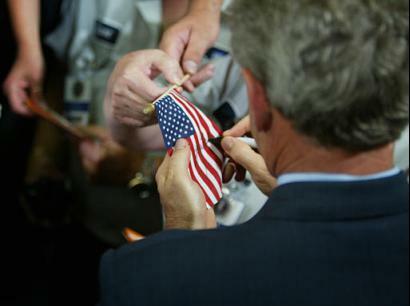 We are allowed to desecrate the flag without fear of repurcussions. We are in an unpopular war. Kids are dying in a foreign country for principles...hey, wait a minute...I thought things had changed? And if they hadn't, shouldn't this guy be, like, put away behind bars? Or maybe at least roughed up a bit for his careless treatment of our flag? Isn't that the flag our men & women are fighting for over there? Time to get Mr. Cheney and Mr. Ashcroft involved in this case; they'll set this guy straight.